Starting this evening, November 14, at 8 p.m. 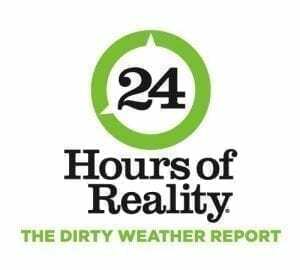 The Climate Reality Project will host its latest big media event, 24 Hours of Climate Reality: The Dirty Weather Report. For 24 hours, starting in New York City, the live broadcast will spread across the globe in all 24 time zones, putting a spotlight on every region of the world and featuring news, commentary and multimedia content to inform and empower you and I to understand and do something about climate change. On hand will be scientists, experts, musicians, comedians and citizens of the world talking about climate and its impact in their lives. And that includes you – through social media, The Dirty Weather Report wants to hear how climate change is effecting your life and your neighborhood. Find out more about it in the video below or watch live starting at 8 eastern time.